Gases from volcanoes give rise to numerous impacts on climate, the environment, and people. U.S. Geological Survey (USGS) scientists are inventorying gas emissions at many of the almost 70 active volcanoes in the United States. This effort helps build a better understanding of the dynamic processes at work on the Earth's surface and is contributing important new information on how volcanic emissions affect global change. Ash column generated by the eruption of Mount Pinatubo, a volcano in the Philippines Luzon volcanic arc, on June 12, 1991. The climactic eruption of Mount Pinatubo occurred three days later on June 15, 1991, and was one of the largest eruptions of this century. The climactic event lasted about 9 hours and erupted over a cubic mile of rock material. It injected a 20- million ton sulfur dioxide cloud into the stratosphere to an altitude of more than 20 miles. 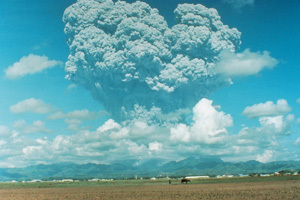 The climactic Pinatubo cloud was the largest sulfur dioxide cloud ever observed in the stratosphere since the beginning of such observations by satellites in 1978. It caused what is believed to be the largest aerosol disturbance of the stratosphere this century, although smaller than the estimated disturbances from the eruptions of Tambora in 1815 and Krakatau in 1883. Sulfate aerosol formed in the stratosphere from sulfur dioxide in the Pinatubo cloud increased the reflection of radiation from the Sun back into space. Consequently, the Earth's surface cooled in the three years following the eruption, by as much as 1.3 degrees ( Fahrenheit scale) at the height of the effect. The sulfate aerosols also accelerated chemical reactions that, together with increased stratospheric chlorine levels from man-made chlorofluorocarbon (CFC) pollution, destroyed ozone and led to the lowest ozone levels ever recorded to date in the stratosphere. Scientists now know that the "smoke" from volcanoes, once attributed by poets to be from Vulcan's forge, is actually volcanic gas, and an important agent of global change. The molten rock, or magma, that lies beneath volcanoes contains abundant gases that are released to the surface before, during, and after eruptions. These gases range from relatively benign low-temperature steam to thick hot clouds of choking acid fume jetting from the earth. A significant component of volcanic gas research involves measuring the quantities of gas that volcanoes release into the atmosphere. Huge amounts of volcanic gas, aerosol droplets, and ash are injected into the stratosphere during major explosive eruptions. Some gases, such as carbon dioxide, are greenhouse gases that promote global warming, while others, like sulfur dioxide, can cause global cooling, ozone destruction, and polluted air known as volcanic smog or "vog". Studies of volcanic emissions allow scientists to compare volcanic gas output to emissions from man-made sources and to assess the effects of both past and future eruptions on the Earth's climate. Volcanic gas can also be directly harmful to humans, animals, plants, agricultural crops, and property. Usually, the hazards from volcanic gases are most severe in the areas immediately surrounding volcanoes, especially on volcano flanks downwind of active vents and fumaroles. But these hazards can persist for long distances downwind following large eruptions, or from volcanoes erupting gas-rich magma. Large, explosive volcanic eruptions inject water vapor (H2O), carbon dioxide (CO2), sulfur dioxide (SO2), hydrogen chloride (HCl), hydrogen fluoride (HF) and ash (pulverized rock and pumice) into the stratosphere to heights of 10-20 miles above the Earth's surface. The most significant impacts from these injections come from the conversion of sulfur dioxide to sulfuric acid (H2SO4), which condenses rapidly in the stratosphere to form fine sulfate aerosols. The aerosols increase the reflection of radiation from the Sun back into space and thus cool the Earth's lower atmosphere or troposphere; however, they also absorb heat radiated up from the Earth, thereby warming the stratosphere. Several eruptions during the past century have caused a decline in the average temperature at the Earth's surface of up to half a degree (Fahrenheit scale) for periods of one to three years. The sulfate aerosols also promote complex chemical reactions on their surfaces that alter chlorine and nitrogen chemical species in the stratosphere. This effect, together with increased stratospheric chlorine levels from chlorofluorocarbon pollution, generates chlorine monoxide (ClO), which destroys ozone (O3). As the aerosols grow and coagulate, they settle down into the upper troposphere where they serve as nuclei for cirrus clouds and further modify the Earth's radiation balance. Most of the hydrogen chloride (HCl) and hydrogen fluoride (HF) are dissolved in water droplets in the eruption cloud and quickly fall to the ground as acid rain. The injected ash also falls rapidly from the stratosphere; most of it is removed within several days to a few weeks. Finally, explosive volcanic eruptions release the greenhouse gas carbon dioxide and thus provide a deep source of carbon for biogeochemical cycles. (figure modified from Richard Turco in American Geophysical Union Special Report: Volcanism and Climate Change, May 1992). Health hazards can range from minor to life threatening. Exposure to acid gases such as sulfur dioxide, hydrogen sulfide, and hydrogen chloride can damage eyes and mucous membranes along with the respiratory system and, under extreme conditions, can lead to death. The health effects from exposure to prolonged periods of volcanic smog are not well documented, but the common complaints include headaches, fatigue, respiratory difficulties, and allergic reactions. The toxicity of carbon monoxide is well known, although it is rarely abundant enough in volcanic gases to cause serious problems. A very serious hazard can occur under certain conditions from volcanic emissions of carbon dioxide. Carbon dioxide is heavier than air and can collect in low and poorly ventilated places. Nearly two thousand people have died of carbon dioxide asphyxiation near volcanoes in the past two decades, most of them in Cameroon, Africa, and in Indonesia. Recently, there have been cases of near asphyxiation from carbon dioxide emissions at Mammoth Mountain, a young volcano on the eastern front of the Sierra Nevada mountains in central California. Volcanic gases can also severely damage vegetation. Direct exposure to concentrated volcanic gas or long-term exposure to dilute volcanic gas is lethal to most types of foliage. Since 1990, areas of dying forest around Mammoth Mountain have grown in size and number because of high concentrations of carbon dioxide in the soils and now occupy more than 100 acres. Volcanic gas research increasingly emphasizes the impacts of volcanic emissions on climate, the environment, and people. The principal activities in these societally important areas of research include monitoring the compositions and amounts of gases released from active volcanoes. A prominent part of this work involves improving existing techniques and developing new methods. The table below summarizes the principal methods currently used. 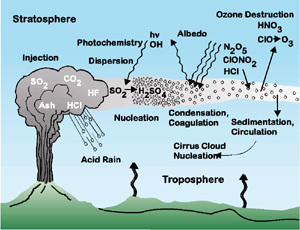 Fume clouds from volcanoes also contain water droplets in which acid gases have dissolved. Most of these droplets eventually fall to earth as acid rain, but while they remain in the atmosphere, they can also cause corrosion of aircraft surface materials and engines. Utility lines, communications equipment, farm machinery, vehicles, and other metal objects corrode when exposed to volcanic gases or acid rain. Persistent acid rain causes galvanized nails or lead solder in water catchment systems to deteriorate and release toxic metals into drinking water. Hydrogen fluoride gas emitted from a volcano can attach itself to ash particles. When these particles fall to earth, chronic and fatal fluorosis can follow when grazing animals eat contaminated forage. Until recently, the study of volcanic gases required direct collection from volcanic fumaroles (vents), and transport to an analytical laboratory for detailed chemical analysis. A new approach involves installing chemical sensors in or near volcanic vents and linking them to radio telemetry devices to send a continuous stream of data on one or more gases to an observatory. This method can detect significant short-term releases of gas that will usually be missed by occasional sampling. Emissions of certain gases can also be measured in the plume discharging from a volcano. Scientists use optical spectrometers mounted on tripods, vehicles, airplanes, and satellites to measure volcanic gases in plumes. This equipment provides a measure of the total output of one or more gases and is valuable in measuring how much volcanic gas is released into the atmosphere and forecasting what its environmental impacts are likely to be. Studies by scientists at the U.S. Geological Survey have revealed the compositions and amounts of gases released from many active volcanoes in the U.S. (California, Oregon, Washington, Wyoming, Alaska, and Hawaii). As an example, USGS scientists studying the gases of Mount St. Helens have determined that a total of about 2 million tons of sulfur dioxide were emitted between 1980 and 1988. Sensors aboard a satellite detected about 1 million tons of sulfur dioxide injected into the stratosphere during the climactic eruption on May 18, 1980. Another half-million tons of sulfur dioxide were dissolved in water droplets attached to ash particles that eventually fell to earth. The remaining half-million tons were emitted from the volcano during the eight years following the climactic May 18 eruption. Careful study of Mount St. Helens gases using chemical sensors installed in the crater along with airborne measurements of sulfur dioxide revealed periods of increased gas emission prior to four eruptions during 1984-86. These measurements allow important comparisons with sulfur dioxide emissions from power plants and other man-made emission sources. This ongoing work is helping USGS scientists to better understand the dynamic processes and interactions that characterize the Earth's surface and is contributing important new information on how volcanic emissions affect climate, the environment, and people.